This chapter is the first empirical chapter. 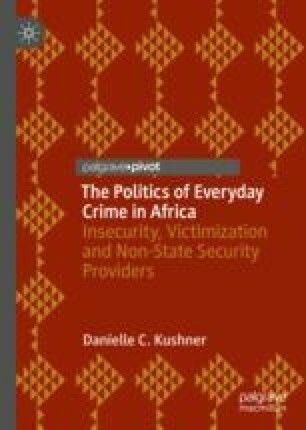 Using original survey data collected on hundreds of South African citizens, and original data from interviews with elected officials, civil society organizations, and police officers, Kushner explores the impact that non-state security reliance and South Africans’ broader experiences of victimization and insecurity have on their perceptions of state legitimacy. She finds that non-state security reliance strengthens perceptions of state legitimacy in some instances while undermining it in others. The finding critically hinges on how ordinary South Africans view the state’s responsibility and role in the provision of security.